We here at SolidBox value productivity above all in our applications and of course, our hardware. Each week, we’ll be giving you a tip to help you enhance your productivity with SolidWorks specifically. Sorry, we can’t help you with the hours you spend on Youtube each week watching cat videos. Nonetheless, hopefully you can learn something to make your SolidWorks experience easier. 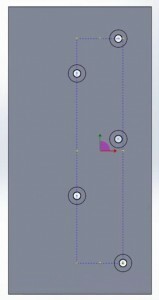 This week we’ll discuss how to use the Sketch Driven Pattern with the Hole Wizard in SolidWorks. Using the Hole Wizard is pretty standard fair for most SolidWorks users. However, when used in conjunction with the Sketch Driven Pattern, creating holes with relations to other holes is a cinch. Then editing the location and number of holes further into the design process is equally simple. This video breaks down when and how to use the Hole Wizard in tandem with the Sketch Driven Pattern Tool.